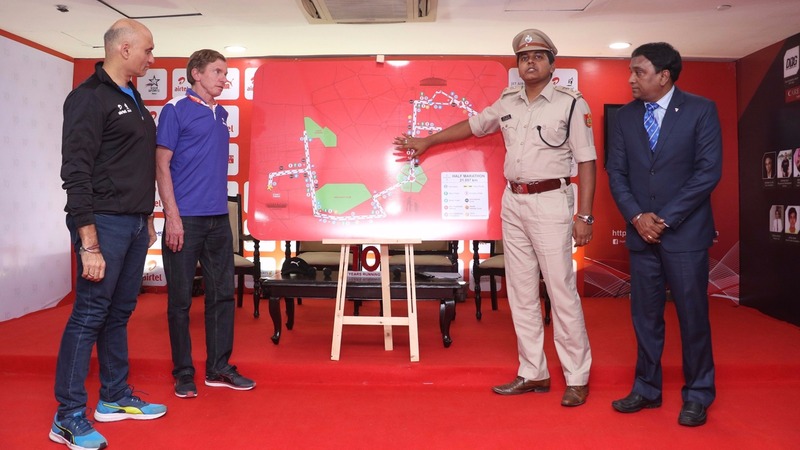 Procam International, promoters of the Airtel Delhi Half Marathon (ADHM), outlined arrangements that will be put in place for the 35,000 participants for Sunday, 19th November along with medical facilities and the route at a media conference at the Jawaharlal Nehru Stadium on Wednesday. Present on the occasion were Hugh Jones – Race Director, ADHM, Dr Krishlay Datta, Medical Director, Rajeev Ranjan, Deputy Commissioner, Traffic, Central Range and Vivek Singh, Jt. MD, Procam International. With the current challenges that the capital city is facing, Procam International has worked on an elaborate plan of action in consultation with experts from Centre for science, technology, policy makers to identify source contribution. From this data, measures are being deployed to provide the best of atmosphere for runners to have a safe and memorable race day at ADHM 2017. ADHM is inherently a green event as vehicles are kept off the road (pre and during race) which directly addresses the Passenger & Freight contributors. To address the urban dust and particulate matter water is being deployed. Dust & vehicular pollutants are being addressed directly on the course and holding area. 12:00 am: Entire course being washed with salt mixed in effluent treated water to increase the binding with the dust and reduce this contributor to the SPM. Potential dust hot spots adjoining / near proximity of the course have been pre identified, and are being sprinkled twice pre the course being opened for runners. 2:00 AM – 11:00 AM: 110 plus mist fans being deployed at varying heights inside the JLNS to be able to further help precipitation of the SPM. All races start & finish in the JLNS. The pre-race Warm Up, line up sections, and post-race medals, recovery, breakfast & entertainment are the facilities in the stadium. The ADHM in addition to being an inherently green activity is also a 100% waste managed race. All waste material collected is recycled by engaging with various NGOS and organizations. The plastic waste generated is used to make denim, and all tetrapaks are recycled and food + degradable waste is composed and further used for tree plantation. This year Procam International is using NO generators for the event. Amplified sound on the course has been shut, and only live music would be deployed in the motivational zones. In addition to this, the international, national and amateur participants have stayed committed to the race and it would be prudent to state that these are 'athletes' and not 'couch dwellers' training in the same environment. Their trained ability is best known to them and the Medical Director has issued a medical advisory for race day. Rajeev Ranjan, Deputy Commissioner, Traffic, Central Range reassured that adequate arrangements are in place for the event to be conducted in a smooth fashion. “We will ensure safety and security is upheld during the event, law and order is in place. Traffic will be diverted for race hours and adequate alternative routes have been made for the rest of the general public. In this way, neither the event nor the general public will be affected,” explained Mr. Ranjan. For the benefit of the runners, six medical stations are deployed across the course and seven ambulances are located at various junctions like Lodhi Road & Bishma Pitamah Marg junction, Mathura Road, Subramanim Bharti Marg, Zakir Hussain Marg and India Gate, Rajpath & Janpath, Red Cross and Sansad Marg. There will be Bike Responders and Medics on Bikes who will be able to alleviate any issues faced on race day. With the detailed Medical deployment, and trained personnel, the team is well-equipped to handle any medical emergencies that any runner may face. On race day, all those participating in the run have been given clear medical instructions as to their health and safety and have been advised to seek medical help if they have breathing difficulties. The six medical stations and two base camps on route supervised by 75 doctors, 50 physiotherapists and over 100 nurses. There will be one Base Camp at the Start and Finish of the Half Marathon and the Great Delhi Run and the second base camp at the Start/Finish of the Senior Citizens’ Run. To keep all participants sufficiently hydrated there will be 12 water stations along the route, from where around 98,000 litres of Bisleri water will be distributed. There will be 5 ORSL restoration stations on the course and chocolates and salted oranges for the participants. Besides these arrangements, there will be Law & Order and Traffic Police on Race Day to prevent any untoward incidents. 800 private security guards along with more than 1300 volunteers, 126 bouncers and 35 CC TV Cameras will supplement the security efforts. 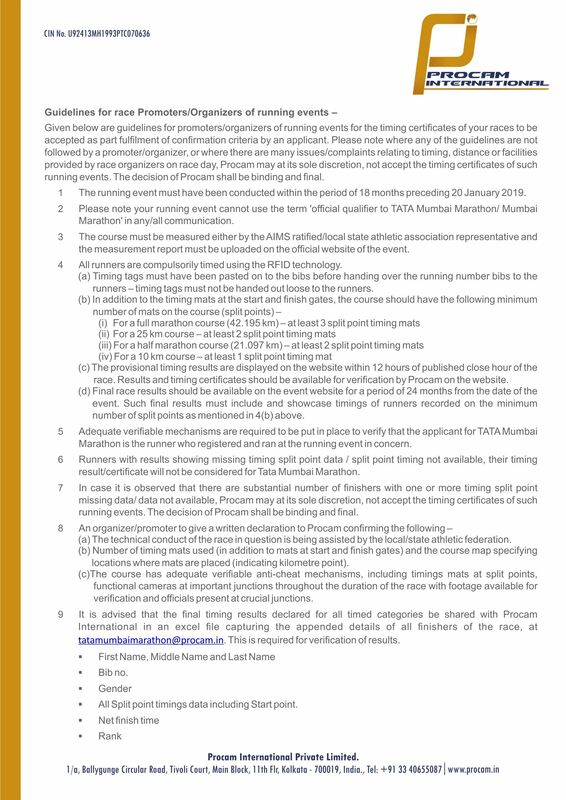 On Race day, for security reasons, only registered participants of Airtel Delhi Half Marathon 2017, wearing the right bib and event’s official crew, will be allowed entry into the Jawaharlal Nehru Stadium. The Airtel Delhi Half Marathon will be telecast live on Star Sports Select 1SD & Star Sports Select 1HD, 6:30 am to 10,00 am. Half Marathon Elite Men will kick-off at 6:40 am, Half Marathon Elite Women will kick-off at 6:50 am followed by Half Marathon for open category. The newly introduced 10k run will be flagged off at 7:30 am, Champions with disability at 7:40 am followed by Senior Citizen’s run at 8:00 am and Great Delhi Run at 9:30 am.